A compact, snug villa with a well-tended garden (800 sq. 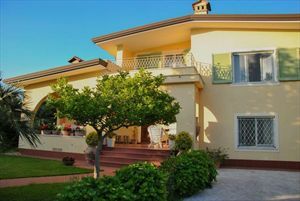 m.), located close to Forte dei Marmi center at a distance of about 700 meters away from the sea. The garden features a parking, barbecue area, outdoor shower, terrace with dining table. The villa is equipped with air conditioning, alarm system, Wi-Fi, automatic gate. The ground floor comprises a living room with a sofa bed, double bedroom, dining room, kitchen and bathroom with tub. The upper floor consists of a double bedroom and a bathroom with shower.